Finding blackbanded sunfish in Georgia is like hunting for needles in haystacks. Just add mud, gnats, heat and tannin-stained water. Since last summer, a Valdosta State University team working with Georgia DNR's Nongame Conservation Section has pulled seines, set traps and used dip nets in Carolina bays, swamps and streams thick with muck and aquatic plants in search of this elusive fish. The State Wildlife Grants survey led by biology professor Dr. David Bechler and graduate student Josh Salter has found a new blackbanded sunfish population – the first new population in Georgia since 1980 – and confirmed another not documented since 2001. The findings will help conserve a fish state-listed in Georgia as endangered and considered an indicator of the health of the natural ecosystems it inhabits. Read about the Aquatic Conservation Initiative in Nongame Conservation's annual report. “The discovery of new populations improves (the species’) overall conservation status and decreases the need for more regulations in the future,” said Dr. Brett Albanese, senior aquatic zoologist with the Nongame Conservation Section. Less than 4 inches long and marked by black bars on the sides, blackbanded sunfish are found below the fall line from New Jersey to Florida. Yet the fish is threatened across its range because of habitat loss to natural and man-made causes such as drought and development. The presence of the fish on private lands – and likely at sites not yet documented – makes the role of landowners crucial. 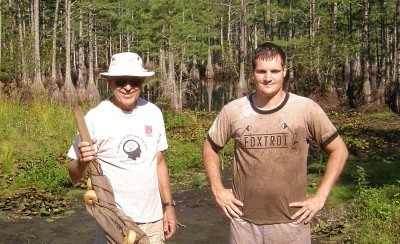 Salter (pictured, right, with Bechler below) said the Valdosta State crew has surveyed 72 sites, and hopes to have sampled each at least three times before the survey is finished in August. Return trips highlight the difficulty in finding blackbanded sunfish. Researchers sampled a site in the Aucilla River drainage twice, but no luck. The find marked the first time in 11 years the sunfish had been found at the Thomas County wetland, providing more data for conserving a species as unique as needles in haystacks. Landowners with possible blackbanded sunfish sites are encouraged to contact Brett Albanese, (706) 557-3223 or brett.albanese@dnr.state.ga.us. Prime habitats, such as the site above, include Carolina bays and other wetlands with plenty of aquatic vegetation, peat and even old-growth trees. Finding a state-protected fish species on private property does not restrict what landowners do with the property. The state regulations do not affect habitat on private lands, but prohibit only the intentional killing or commercial use of wildlife. Threats to blackbanded sunfish are compounded by what Albanese calls the species' "patchy distribution." Populations are usually isolated. In south Georgia, the fish has been documented at 11 sites spread across the region, from the Okefenokee Swamp to the Alapaha River system near Tifton and the Aucilla River drainage south of Thomasville. The distance between populations makes each more vulnerable. If one is wiped out, the opportunities for other blackbanded sunfish to migrate to that site and replenish it are limited. One of the things I enjoy most about watching wildlife in my backyard is that I get watch animals engage in all sorts of activities from the comfort of my home. However, there is one activity that has eluded me: anting. Anting is one of the most bizarre and little known behaviors exhibited by birds and even gray squirrels. There are two types: active and passive. In active anting, a bird will crush an ant in its bill and smear it on its feathers or skin. When passively anting, a bird probes its bill into an ant nest, fluffs out its feathers and then plops down on the mound, allowing the ants to crawl all over its body (video). One of the things biologists debate is why. ... Read more! Striped newts netted last spring in a seasonal pond at Fall Line Sandhills Wildlife Management Area are producing larvae, at least 138 as of July 6. 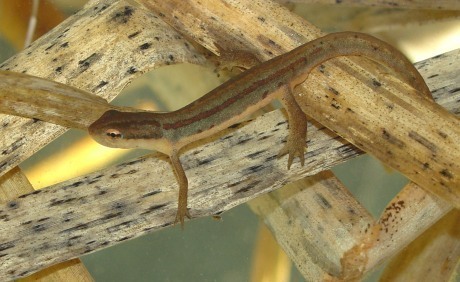 The newts are part of a Coastal Plains Institute project that will bank on captive-breeding colonies to reintroduce the newts to Apalachicola National Forest in Florida (“Fall Line wetland powers projects,” May 2011). The Fall Line pond dried up shortly after the newts were captured. White-nose syndrome research in Georgia will benefit from a $21,000 federal grant aimed at combating the disease that has killed millions of bats but not yet been documented in this state. 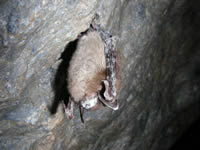 The money will be used to find and monitor bat hibernacula, including training contractors to survey caves and conducting mist-net surveys for bats. The U.S. Fish and Wildlife Service recently awarded $963,000 in grants among 30 states. Some gopher tortoises have crawled more than 500 meters since being released from a pen at Yuchi Wildlife Management Area last month, but all have started digging burrows, writes The Orianne Society’s Javan Bauder, Yuchi project leader (“Keeping relocated tortoises put,” June 29). Sixteen tortoises will be added to a second pen at the WMA next week, all part of an effort to conserve this declining species by better understanding how it acclimates when relocated. The Gopher Tortoise Council is calling for abstracts and announcing registration for its 34th annual meeting, set for Oct. 4-6 in Bainbridge. The agenda features sessions on upland snake research, habitat conservation and gopher tortoise ecology and management. Formed in 1978 by biologists and others concerned about the species decline, the council provides expertise about gopher tortoises and promotes their conservation. From cobras to eagles, DNR nongame cases last month edged into the unusual. Cpl. Dave Sims and Sgt. Don Dasher helped the agency’s Investigative Unit with an undercover purchase of an alligator snapping turtle, a cobra and a crocodile from two people at a Statesboro apartment complex June 21. Charges included possession and sale of a nongame species and possession of wild animals without a permit. At Carter’s Lake, Sgt. John VanLandingham encountered a man and a woman carrying bald eagle feathers and several plant species June 3. The man was also carrying methamphetamine. He faces charges for possessing meth and the bird parts. Check out the DNR Law Enforcement Section’s weekly reports. The Georgia Exotic Pest Plant Council is making plans for its annual meeting and conference. Scheduled for Nov. 8 on the University of Georgia’s Griffin campus, the event will feature keynote speaker Douglas Tallamy, author of “Bringing nature home: How native plants sustain wildlife in our gardens,” and tackle topics such as using prescribed fire to manage invasives and landscaping challenges native plants pose. General registration opens July 13. Learn more about this species and others in our state. Join our friends group, TERN.